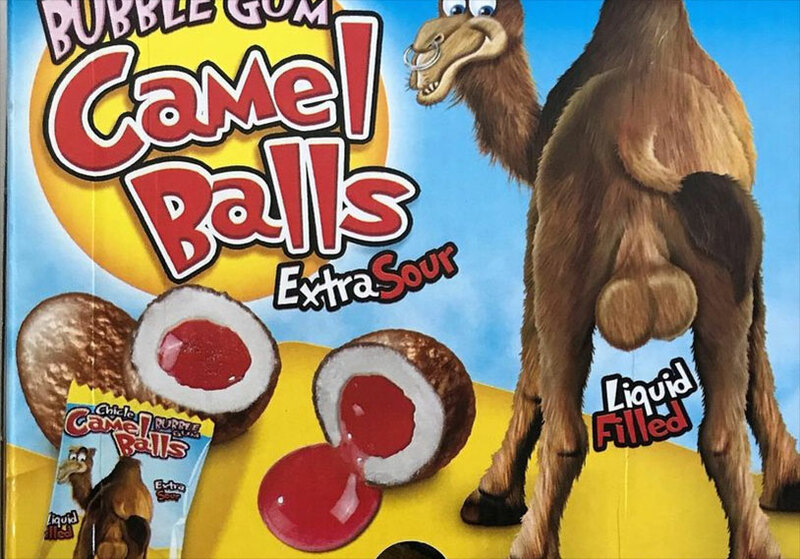 A reader over in the United Kingdom passed along a little tidbit that they thought might be of interest in our obsessive quest to catalog the entire world of testicles: did you know there’s a candy over there called Camel Balls? And before you think it’s just a coincidence, check out that image above – they’re advertised with art of a grinning desert steed showing you his dangling scrotum. Camel Balls are manufactured by Spanish confectionary company Fini and are generally available all over the EU. They consist of a nubbly brown candy shell around a sour gum base and red liquid center, creating a holistic experience that is pretty grotesque. The gumballs have sparked controversy several times since their introduction – in 2013, a British mom made headlines when her 7 year old daughter brought a packet home from the corner shop. A representative from Fini defended the cheeky sweets, and they continue to be sold. So what do you think? Does the idea of chewing some camel balls get your mouth watering, or will you pass on this sweet and sour treat? Our overwhelming love of balls aside, they don’t look particularly appetizing, especially the liquid center. Read more about them at All Sweets And Treats.